As a food blogger who has chosen to write mainly about out-of-the-way and at times little-known places, it is the bitter irony of my online existence that I am by nature sentimental and nostalgic, for it is inevitable that many of the eateries I frequent will close, no matter how good the food (or the story) might have been. Yet despite all the heartbreak, I persevere undeterred, like Hugh Grant after Sandra Bullock in one of their 18 movies together after he realizes that he really can't go on living without her. Except for me Sandra Bullock is a new menuderia y taqueria on Havana and 6th and I knew I wanted her (it) all along. "Taqueria, please just let me explain." Such as it were I was in the former home of Tao Tao Noodle Bar sizing up a new wall menu full of Mexican standards. Looking back, I did try and go to Tao Tao not all that long ago, but it was, you guessed it, closed. Even though I'd never slurped back one of their famed xiao long bao, I was still a little sad to see it shuttered so suddenly. And when I saw that it was going to become a menudaria and taqueria, I had to make it back as quickly as I could, if for nothing else than to help it not turn into a cursed restaurant-swallowing hole. Despite its tagline, I didn't come to El Rico Dicho Menuderia y Taqueria for menudo, as this spicy tripe broth is not as appealing on a Wednesday night as, say, a bleary-eyed Saturday crudo-nursing morning. 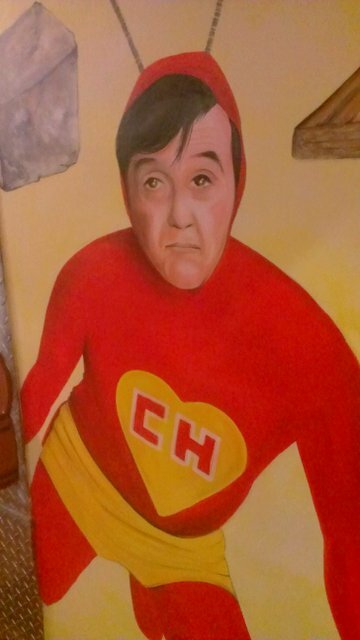 But Rico Dicho is more than just menudo and tacos, and is a step up in decor and ambiance from your typical taqueria, even if that "step up" means a very literal dedication to the greatness of El Chapulin Colorado. 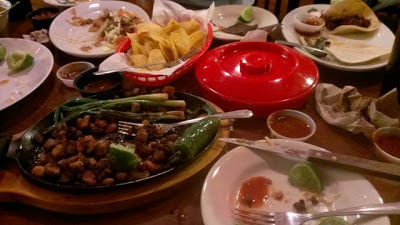 I met a couple of friends there and we ordered a spread of food that filled every corner of the table. Among the consensus favorites was a rich broth of carne seca. 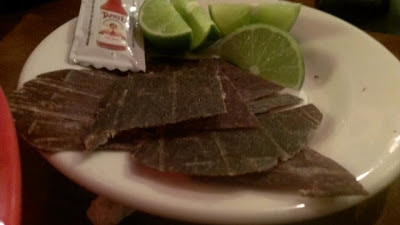 Carne seca translates to "dried meat", and that is exactly what you get. But the Rico Dicho Northern Mexico-inspired version is far from your typical jerky. We were comped a plate of these house made meat strips which we devoured along with a squirt of Tapatio and twist of lime: thin and crispy, yet surprisingly flavorful and not the least-bit chewy. As for the broth? 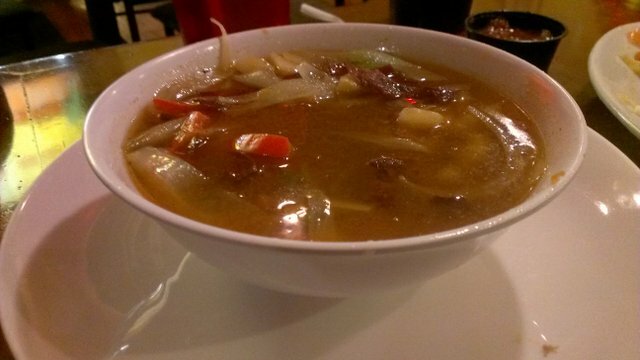 It was a rich beef broth filled with chunks of now-not-so-seca carne, and was balanced nicely by an assortment of chunky potatoes, carrots, onions and peppers. It was a decadent and hearty dish. Rico Dicho also serves another typical Northern Mexico plate, called discada. 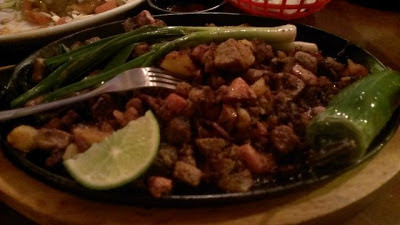 Discada is named for the large disk-like wok it is usually cooked in, and is made up of a medley of chopped meats and veggies. It is much like a Mexico City alambre, but this discada of chorizo, carne asada, salchicha (hot dogs) was worlds better than any alambre I have had in Denver. Speaking of chorizo (as I often do), it, like the carne seca, was made in house. For that reason we also got a plate of tacos de chorizo and were universally smitten with our choice. Mexican chorizo is like bacon in that one can add to about anything and that thing becomes better. And homemade chorizo on a warm corn tortilla makes for a can't miss taco. 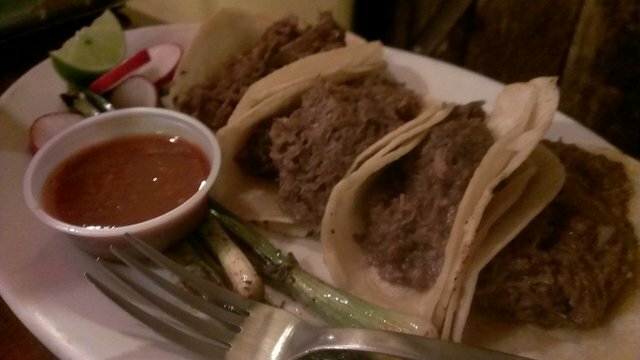 We also got an order of barbacoa tacos, in this case, beef cheek. Steamed and shredded beef cheek is a wonderfully rich and silky-smooth way to enjoy a cow, and simply spiced and served on a plain corn tortilla, this version absolutely killed. 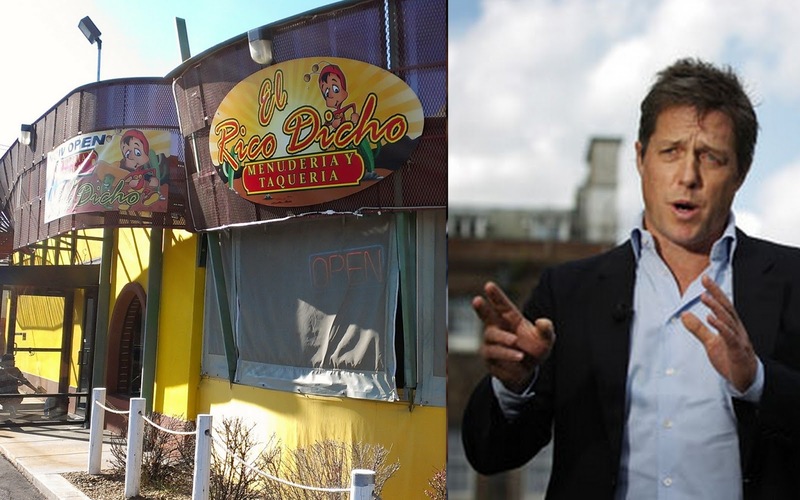 I liked El Rico Dicho enough that I dragged my family back there a few days later for breakfast. 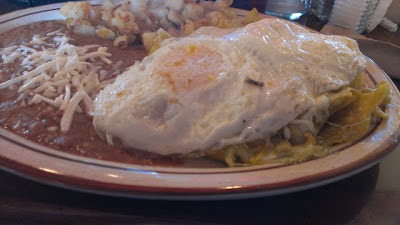 My kids wolfed down their eggs, ham and beans; and I made my way through an enormous portion of an only average plate of chilaquiles made with too-thin tortilla chips that got overly soggy in what otherwise was a nice and spicy tomatillo salsa. My wife ordered huevos de machaca, or scrambled eggs with carne seca. 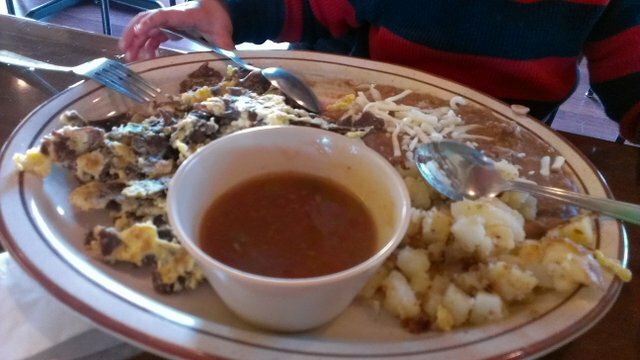 The carne seca was liberally proportioned with the egg, so that it might well have been called carne seca con huevo, and just like a few days before, this delicate and delicious dried meat was again the star of the meal. I was impressed with almost everything I had at El Rico Dicho, save the lack of liquor liscense (it's coming) and the so-called huarache. The masa was way too thick and the size far too small, the carnitas dry and flavorless and the toppings (jack cheese and green chile included) would have been more at home on a smothered burrito. 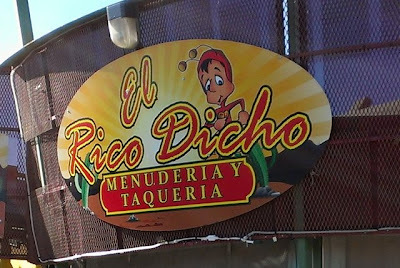 El Rico Dicho has a large menu like many taquerias do, and just like many taquerias, it is likely that not everything is stellar. 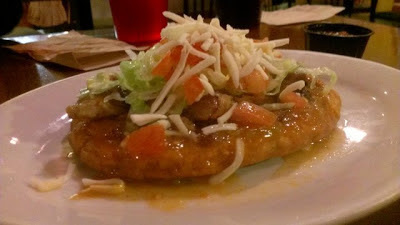 It seems like the Northern Mexican dishes are their specialty, but in addition to all the other regional Mexican dishes they offered, they also had a full menu of Colorado specialties including a Mexican hamburger. Whatever the case, it is undoubtedly worth your while to get over to El Rico Dicho Menuderia y Taqueria on 6th just West of Havana and check them out for yourself. If you want a sure thing, focus on anything that uses the house made carne seca or chorizo (and steer clear of the carnitas), but I am sure there are other great options on that menu as well. They haven't been open long, and I'll hope when I roll back up this spring or summer I'll be able to take advantage of their soon-to-come liquor license on their currently closed patio. If not, it will be yet another terrible heartbreak, and I don't know how many more I can take even though I know there are many more to come.